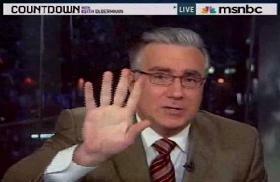 With very little fanfare, MSNBC host Keith Olbermann made a very noticeable change to his show, Countdown. This week Olbermann transitioned from closing the program with a shot at former Pres. George W. Bush to one that takes aim more at Pres. Barack Obama. Since early 2006, Olbermann has closed his Countdown show by counting up the days since President Bush “declared ‘Mission Accomplished’ in Iraq.” That didn’t change when Pres. Obama took office either – then he just made it “former President” and kept the count-up going. So on Thursday May 20 he reached Day 2,576…and that was it. And that is Countdown for this, the 34th day since the Deep Water Horizon oil spill disaster began. I’m Keith Olbermann. Good night and good luck. It continued every night through Thursday (on Fridays Olbermann has been closing his show reading selections from James Thurber because Update: Here’s the reason why). The new sign-off is much less clearly a direct shot at Pres. Obama as the previous one was at Pres. Bush – Bush was actually in the script. But the severity of the oil spill and the inaction in cleaning it up, whoever you want to blame, has forced a noted shift in the preeminent liberal cable news show. With the oil spill clean-up not coming to any easy conclusion for a long time, this new BP-related show-ender will likely be around for awhile.